A man from Conneaut OH who suffered serious injuries when his pickup truck was hit by a CSX Railway train in 2014 has sued the railroad in Lake County OH Common Pleas Court. The man filed the personal injury lawsuit in late January and will be heard by Judge John O’Donnell. The driver alleges that CSX was negligent and this led to the accident because the railroad did not provide sufficient warning of the train approaching. The crossing in question has five sets of tracks, and a train was parked in the middle track. Several other motorists drove around the gates, as did the driver. All of them thought that the gates and lights were turned on because of the train that was parked on the middle track, and it also blocked his view of the oncoming train. His truck was hit at 60 MPH by the CSX train. The lawsuit also states that four of five tracks in that area have parked CSX engines and this obstructed motorists’ view of oncoming trains. Also, the suit states that the gates and lights were activated for several minutes, which could lead motorists to reasonably assume that the parked engines caused the gates to lower. Our railroad injury attorneys in Virginia and North Carolina hope that this injured man fully recovers from his railroad crossing accident injuries. 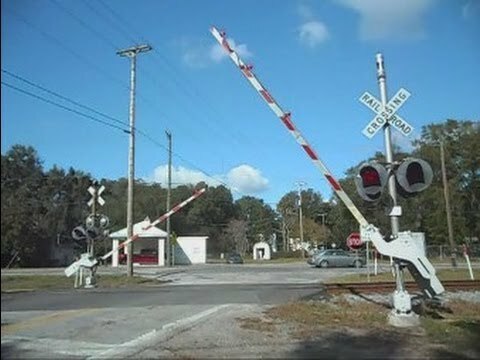 This railroad crossing injury case is interesting because while the motorist did go around the gates, many other drivers did the same as well because the gates and lights were activated for so long. Also, the suit alleges that motorists’ view of oncoming train traffic was obscured by parked CSX engines. It is the responsibility of the railroad to ensure that drivers have adequate sight lines at railroad crossings so that they can cross safely. We have handled Virginia railroad crossing injury cases where the driver was not able to clearly see oncoming train traffic, which led to serious injuries. Any driver who is injured at a railroad crossing should speak to an experienced railroad crossing accident attorney to determine if the railroad properly maintained the crossing so that drivers have an opportunity to cross safely. A New York federal judge in Long Island ruled last week that the Long Island Railroad Company must face a negligence lawsuit due to poor medical advice it allegedly provided to an employee who hurt his back on the job. The judge ruled that there is enough evidence to possibly hold the railroad liable for his injuries. US District Judge Edgardo Ramos denied the motion by the railroad for summary judgement to dodge three negligence claims that the employee asserted against the railroad under the Federal Employers’ Liability Act. The worker sued the railroad for injuries that he suffered when he was drilling into a section of railroad track to repair what is called a heat kink. He also allegedly suffered further back injuries in the physical therapy overseen by Long Island Railroad Company. Ramos ruled that there was sufficient evidence to proceed with the first negligence claim, as LIRR did not provide him with a safe workplace. The judge added that the railroad did not maintain the track, which led to the heat kink forming. The railroad worker was a signal maintainer for 10 years before he had a herniated disc in his back in 2012 on the job. He was doing crossing inspections when he had to fix the heat kink in the track. This involves replacing and reclamping a drill bit, which means he must lug around a 50 pound drill for several hours, which was when he suffered the back injury. On the second negligence claim, the judge agreed that the ‘work hardening’ aspect of his physical therapy may have worsened his back injury. Critically, the physical therapy was overseen by LIRR supervisors who are not doctors or physical therapists. Our railroad workplace injury attorneys in Virginia certainly hope that this injured worker is successful in his lawsuit and recovers fully from his injuries. From the news report, it sounds entirely possible that the railroad could be negligent and this led to his back injury. It is particularly alarming that the man’s supervisors who are not medical professionals oversaw the man’s rehabilitation. A herniated disc is an extremely serious condition and must be handled very carefully by qualified medical personnel. If you have been hurt on the job at a railroad, please review our guide A Railroad Worker’s Rights When Injured on the Job. Many railroad workers regard our guide as the bible on the Federal Employers Liability Act. This federal statute is critical when an injured rail worker gets hurt while working. Understanding this statute is vital in obtaining maximum compensation in a FELA lawsuit, as in this case that we settled for $825,000. A New Iberia, Louisiana railroad crossing where five people have died in the last few years is very close to a busy highway intersection, which causes traffic back ups that can trap cars on the tracks, according to safety experts. However, Louisiana transportation officials have said that the deadly railroad crossing is not going to be improved in the near future. Some potential improvements could include a traffic signal that uses sensors to detect when trains are approaching. Since 2012, at least one train per year has struck a vehicle here. Several people in one vehicle were struck last year. Three of them died, and two others had serious injuries. Witnesses said that other cars were in front and behind the car and were waiting to turn from LA Highway 88, which is only two car lengths from the crossing, onto LA Highway 182. According to a railroad accident investigator, a sensor guided traffic signal could have kept that car off the tracks. As many as 14 trains cross these tracks each day, according to the Federal Railroad Administration. Railroad crossings can be very dangerous places, especially when they are not properly designed and can easily trap cars on the tracks. When our Virginia railroad crossing crash lawyers investigate a case, we use retired railroad workers to investigate how the railroad crossing is designed. We have represented clients in Virginia who were hit at railroad crossings and the proper safety procedures were not implemented there. One Virginia railroad crossing accident case involved a situation where the driver did not have an opportunity to avoid the train because it appeared so quickly and the sight lines of the driver were obscured. That case was settled for approximately $130,000. In the above, case, the grieving family should consult with railroad crossing accident attorneys in Louisiana, as they could have a potential wrongful death lawsuit, given the fact that the design of the crossing has been questioned.